NOTE: Duplicate key exposures may occur when pasting with the Enforce Key Exposure option selected. 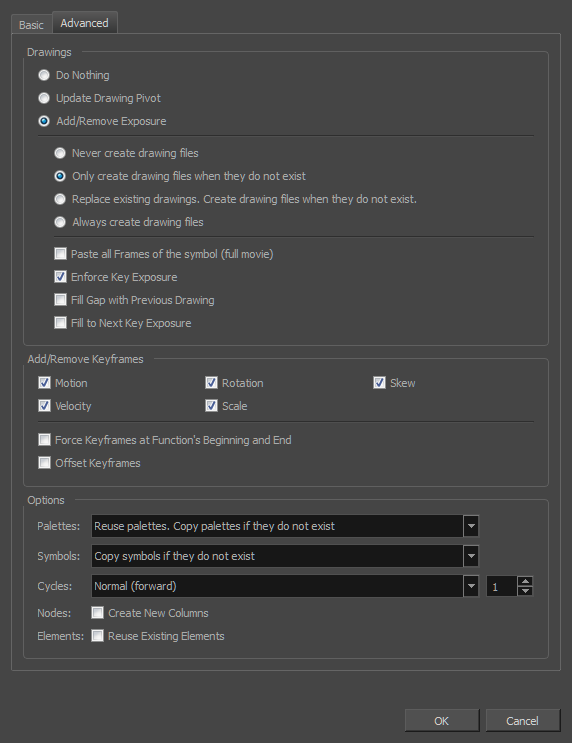 • Enforce Key Exposure: If there are key exposures that exist on copied drawings, they are preserved when pasting. No key exposures are added. This is the default behavior when pasting. • Fill Gap with Previous Drawing: Fills selected area in the Xsheet or Timeline view with the previous drawing. 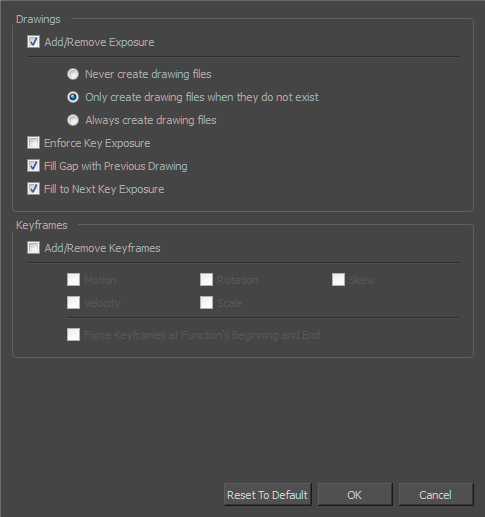 • Fill to Next Key Exposure: Fills selected area till the next key exposure. In the Timeline or Xsheet view, select the drawings you want to copy and press Ctrl + C (Windows/Linux) or ⌘ + C (Mac OS X). ‣ Press Ctrl + B (Windows/Linux) or ⌘ + B (Mac OS X). ‣ From the Timeline menu, select Edit > Modify Paste Presets > Exposure. The Edit Exposure Paste Preset dialog box opens. Select the Enforce Key Exposure or Fill to Next Key Exposure option. In the Paste Special dialog box, these options are on the Basic tab. Press Ctrl + V (Windows/Linux) or ⌘ + V (Mac OS X) to paste your selection.